Tuesday, January 17, 6:30 pm, Tapadiaya Natyagruha, Aurangabad City, India. Friday, January 20, 9:30 pm Yashwantrao Chavan Natyagruha, Pune City, India. Saturday, January 21, 6:30 pm, Gateway of India, Mumbai City, India. Thursday, May 4, 8 pm, Ancient Future Guitar-Sitar Jugalbandi: Indian classical and fusion with Pandit Habib Khan (sitar), Matthew Montfort (scalloped fretboard guitar), and Arshad Syed (tabla), Freight and Salvage, 1111 Addison Street , Berkeley CA 94702. Adm: $18.50 adv., $19.50 door. Half price youth tickets 16 years of age and under. Tickets available at the Freight Box Office, open daily from 12:00 noon - 7:00 pm, by mail order (send check and SASE to Freight at least 10 days before show date), at ticketweb.com, or charge by phone (866-468-3399). Friday, May 5, May 5, 2006, 8 pm Doors open at 7:30. Ancient Future Guitar-Sitar Jugalbandi: Indian classical and fusion with Pandit Habib Khan (sitar), Matthew Montfort (scalloped fretboard guitar), and Arshad Syed (tabla), Cayuga Vault, 1100 Soquel Ave, Santa Cruz, CA. Adm: $15 adv/$18 door. Advance tickets at Gateways Books and Gifts (831-429-9600). Friday, May 19, 8 pm, Ancient Future Arabic Dance Ensemble, St Joseph's Cultural Center, 401 S. Church St., Grass Valley , CA. Adm: $15 at the door. Info: Sacred Music Events at 530 613-1865. Saturday, July 15, 8 pm, Ancient Future Arabic Dance Ensemble, Benefit Concert for UCO Lick Observatory, Main Building Hall, Mount Hamilton, CA. Adm: $40 general seating, $100 preferred, $150 VIP. Tix: UCSC ticket office 831-459-2159 after May 2, 2006. Info: 408-274-5061, www.ucolick.org. Friday, July 21, 2006, 7:30 pm, Ancient Future Arabic Dance Ensemble, Friday Night Live, Outdoors, Downtown Cloverdale, Adm: FREE! Info: Cloverdale Arts Alliance: 707-894-4410, www.cloverdaleartsalliance.org. Saturday, July 29, 2006, 10:00 pm -4:00 am, Ancient Future Organic Trance Trio, ANON GALLERY, 285 9th St., San Francisco, CA, Suggestive Donations: $10 before 10:30, $15 - $20 after. 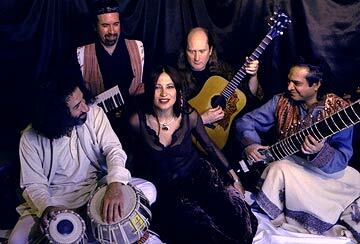 Friday, August 25, 2006, 8 pm, Ancient Future Guitar-Sitar Jugalbandi: Indian classical and fusion with Pandit Habib Khan (sitar), Matthew Montfort (scalloped fretboard guitar), and Arshad Syed (tabla), Future Studios, 30 Hozoni Dr., Sedona, AZ. Adm: $15 adv., $18 door. Tix: 928-282-9139. Ancient Futures first ever appearance in Sedona. Saturday, August 26, 2006, 6:30 pm, Ancient Future Guitar-Sitar Jugalbandi: Indian classical and fusion with Pandit Habib Khan (sitar), Matthew Montfort (scalloped fretboard guitar), and Arshad Syed (tabla), Pakistani Information and Cultural Organization, Independence Day Celebration Event: Diversity through Fusion, Sheraton Crescent Hotel, 2620 W Dunlap Ave., Phoenix, AZ. Tix: $60 for full event including dinner. Info: 480 515-2030 or email info@pakistaninformation.org. Sunday, September 17, 2006, 4:45-5:45 pm, Ancient Future Organic Trance Trio, Earthdance, Black Oak Ranch, Laytonville, CA. Friday, September 29, 2006, 8 pm, Ancient Future Arabic Dance Ensemble, Pangaea: The URI Roots Music Series, Edwards Auditorium, Upper College Road, University of Rhode Island, RI. Adm: FREE! Info: 401-874-2215. Saturday, September 30, 2006, 7:30 pm, Ancient Future Arabic Dance Ensemble, Kripalu Center, 57 Interlaken Road, Stockbridge, MA. Adm: $10. Tickets are available the day of performance via the Kripalu gift shop and front desk. Information: 1-800-741-7353. Sunday, October 1, 2006, 7:30 pm, Ancient Future Arabic Dance Ensemble, Alwan For The Arts, 16 Beaver Street, 4th Floor, New York NY. Adm: $15. Tix: 212-967-4318. info@alwanforthearts.org. Monday, October 2, 2006, 8 pm, Ancient Future Arabic Dance Ensemble, Passim Folk Music and Cultural Center, 47 Palmer St., Cambridge MA. Adm: $12. Tix: 617-492-7679 and online at www.clubpassim.com. Sign the guest book and register for a monthly drawing with prizes including concert tickets, CD's, t-shirts, etc! Join the Ancient Future concert mailing list, or send Ancient Future your feedback.